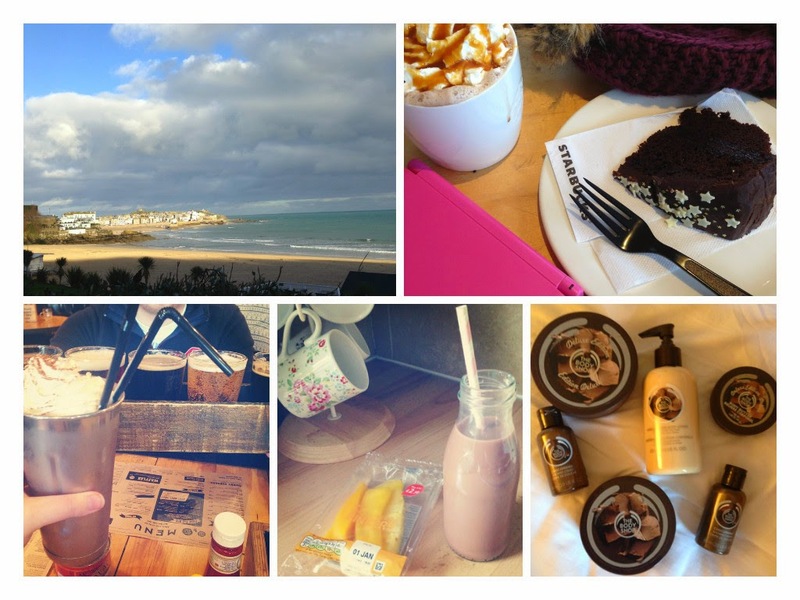 Just a quick little post to show case five little things I've been loving lately...and I've only just noticed that they're nearly all chocolate related! St Ives. I fell in love with St Ives in Cornwall when I went for Christmas down to my Mum's house. It's the cutest little seaside town I've ever been too, full of pokey shops, cobbled streets and adorable fishermen's cottages all sitting atop one another. I went to all 5 beaches, saw the Tate St Ives, played on the amusements arcade and did a small bit of shopping. If you ever have the chance to holiday in Cornwall then St Ives is a must see. I popped into town to do a bit of last minute sales shopping the other day and decided to stop in Starbucks. I played my 3DS while I sipped on a caramel hot chocolate and munched a delightful slice of chocolate cake. Oh so indulgent, but oh so naughty! When I was in St Ives we ate in a bar / restaurant on the seafront called Hub. It's going down as my favourite place to eat in St Ives, as we went there twice and I had the same thing both times, pulled pork nachos - yummy! On both occasions I also got an American style chocolate milkshake made with Cornish ice-cream which was both huge and incredibly tasty. My brother and J also got themselves a beer flight each, which went down rather well I'm told! Continuing on the milkshake theme, I've been loving chocolate almond milk in my cutesy little milk bottle couple with some pineapple and mango for breakfast - yummy. Finally, my beloved Chocomania Body Shop range has been discontinued! Queue the tiny violins! I first posted about this range back in 2012 here and instantly fell in love with it. I went into the Body Shop just before Christmas to see if I could find any of the range and it'd all gone. It's back in the sale to shift the last stock, so if you love this range then get stockpiling just like I've recently done! Wow St Ives sounds gorgeous. I'm actually heading there for my best friends wedding in March. Annoyingly though there'll be little to no time to explore - due to lack of holiday days we're flying in and out :( I'm gutted!